Yay! The first FO of the year!! I had actually finished it the first week of January but I've only finally gotten around to getting some photos taken now, albeit some crappy photos at that. I know I say this with everything I knit, but this project is my new favourite. As a matter of fact, the second I finished sewing on the buttons I had worn the cardigan for a week straight! I'm sure the lovely ladies of my knitting group are sick of seeing it too. This project definitely had some ups and some major downs, but I'm extremely happy with how it turned out. Also, without realizing it, I've accomplished one of my 101 goals from knitting this project, which was to "knit a project that involves lace work". 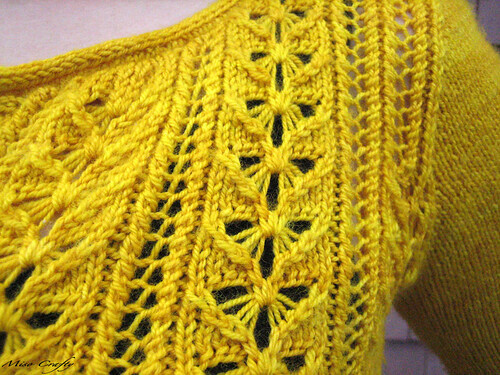 While blocking I was checking out the photos on the pattern to make sure I wasn't overly stretching out the stitches when my eye caught the cardigan description that mentions that the "Honeybee is a light, lacy cardigan". Bonus! Now that's what we would call a two-fer!! 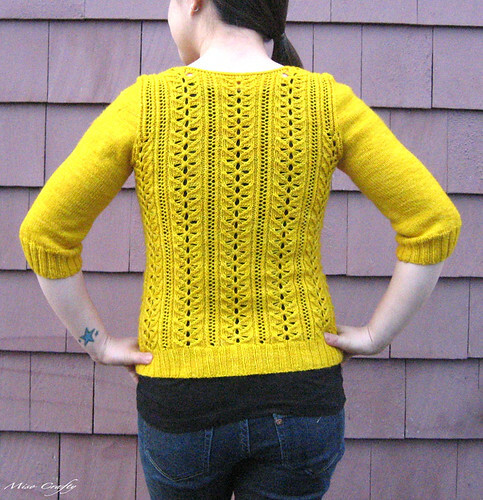 There are so many elements that I love about this cardigan. Aside from my love of the colour, I love the fact that there were only 2 really small seams that I had to graft together. Even the shoulders didn't require any sewing, instead they were bound off together using the 3-needle bind off technique (which, I have to say, I now absolutely love this method of finishing shoulder seams!). The sleeves were knit in the round and then later joined to the body by knitting the cap along with the rest of the yoke of the cardigan. Brilliant!! Although, when I first started knitting the sleeves I had cast on the amount of stitches called for and then had knit about 5" of the first sleeve before coming to the realization that it was going to be way too big for me. I don't by any means have thin arms (quite the opposite really, I think they are "meaty"), but what I had on the needles at the time was huge! So I ripped and cast on for the extra-small and increased the 4 stitches need to turn the sleeve back into a small around the underarm. It worked out perfectly! I was a little nervous about finding the right buttons for this. I wasn't quite sure what I wanted or how they should look. Wooden? Plastic? Metal? Plain? I was all ready to make a few trips to the various fabric and yarn shops around town in search of the perfect buttons but decided to take a quick look in my stash first. I'm so glad that I did! 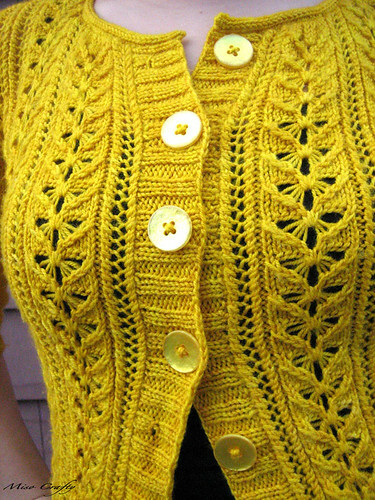 I had completely forgotten that I had purchased some yellow buttons at Dressew way before I had even considered knitting with, let along buying yellow yarn. When I first found the buttons in my stash I only saw 7 and was trying to convince myself that not having the 8th button at the bottom was OK. Imagine my sheer delight when I went back to my button stash and rummaged around some more and found another button! Yay! Ravelry has definitely helped me a ton too. If you need any help, let me know! I can't guarantee that I'll be of any use, but it's worth the try! Beautiful! I love it. I don't know how you do it, get all your projects to fit you so well. 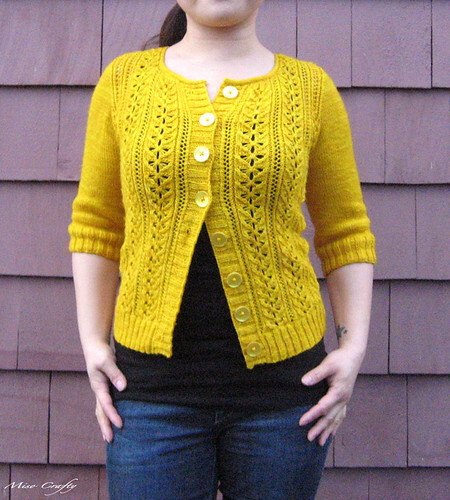 After having so many misfits with my cardigans, I'm so hesitant to start another one but this is so gorgeous that it is making me re-think my fear and want to jump straight in. congrats! that is so pretty. i love it! Thanks for the offer of help Mel! I think my biggest problem is I get so excited about doing a project that I don't fully read the instructions first. The jen cardi uses 5ply yarn but then it stretches so could I just use bigger yarn say 8ply to knit it with? How do you know what yarns are going to stretch and which aren't? Email me on ksultanie(at)yahoo(dot)com then we won't block up your comments with all my questions. Thank you for the lovely compliment! I think you should definitely try knitting a cardigan again. I've had lady luck on my side so far, but I'm also a fan of trying things on as I go. I think that's another reason why I'm not a fan of garments knit in pieces - you can't really tell if they'll fit or not! Wow! Thank you! :D I'm very flattered and hope that I don' disappoint in the future! I'll email you soon! I hope I can help!